Tangerine trees can contract several diseases, which display symptoms on the leaves or the fruit and are easily distinguished from one another. Most tangerine diseases can be controlled once identified. Trees that are given regular water and fertilizer and are planted in a location receiving good air circulation are less prone to disease than those in less optimal conditions. Alternaria brown spot affects Dancy and Murcott tangerines, among other varieties of tangerine and citrus. The disease causes brown spots and yellow discoloring of tangerine leaves; leaves can eventually fall off the tree. Branches and twigs may die back at the tips, and fruit can develop brown blemishes on its skin. The University of Florida suggests planting disease-resistant types of tangerine and controlling the fungus with a copper-based fungicide. Greasy spot affects both tangerine trees and tangerine hybrids, though it hits grapefruit and orange trees worse. Symptoms of this include yellow and brown spotting on the leaves and blistering on the leaves that makes them appear greasy, hence the disease name. Copper fungicides and preventative spraying can control greasy spot. 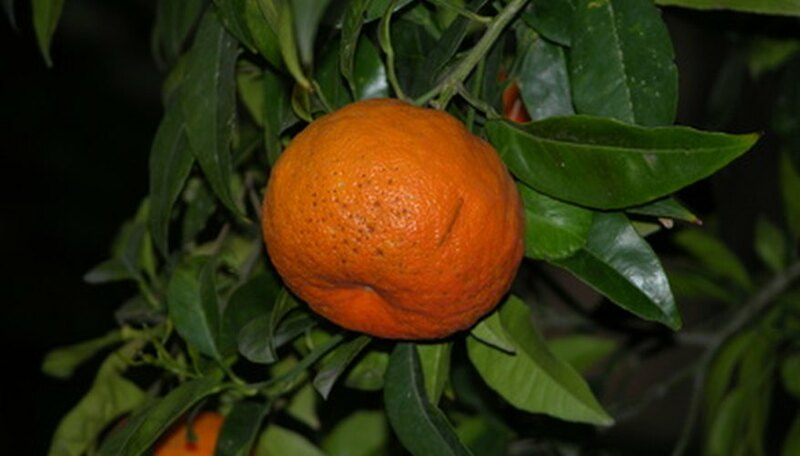 Tangerine hybrid trees can contract citrus scab, which gives fruit pinkish-tan lesions on its surface. The lesions turn dark brown, then gray before cracking. Tangelos and Murcott tangerines can experience both citrus scab and Alternaria brown spot at the same time, warns the University of Florida. Growers can control this disease with copper fungicide. Phytophthora causes root rot in tangerine trees. Symptoms include rotting of the trees roots (difficult to detect since this happens underground), peeling of the bark along the trunk and the tree crown, die back of branches and eventual death. Phytophthora root rot occurs when trees are planted in poor draining soil so that the roots stand in water. There is no known cure; growers should plant trees in well-draining soil.